When I was on the staff of my college newspaper, a group of young, liberal skeptics would always mock Christianity. One of the arguments they always used to show the pointlessness of the scriptures was the prohibition in the Old Testament law against blending two types of fabric. “Why would God care about something so petty?” they would ask. At the time I didn’t have an answer, but I’m so glad that they mocked this bit of scripture because it motivated me to find out why this commandment was there, and it turns out that understanding this commandment opens up the whole Bible and its beautiful message of grace! The mystery of the woolen and linen begins to unfold right after the Fall. Adam and Eve were tempted by Satan and disobeyed God, eating of the fruit of the Tree of the Knowledge of Good and Evil. Immediately after this they felt guilt, shame, and fear, and covered themselves with fig leaves, hiding from God. When God confronted them, he pronounced the consequences of their actions and then covered them with furs. God covered them immediately by shedding the blood of an animal and giving them furs to cover themselves. After this, Adam and Eve must have known the shedding of blood was the requirement for covering sins because Cain and Abel also knew about it. Abel offered the proper sacrifice, the blood of a lamb, but Cain offered vegetables as an offering. The author of Hebrews tells us in verse 11:4 that Abel’s sacrifice was a more “acceptable” offering. Why? Because there’s only one way for sin to be covered (to be made righteous)–through the blood of a lamb. Not through fig leaves or vegetables, but by shed blood. When Moses brought the Israelites out of Egypt, he was told by God to have the people apply the blood of a lamb to the doorposts of their homes in order for the death angel to know to pass over that home. (Exodus 12: 7, 22.) This is another example of the blood of a lamb being acceptable to God as a covering. This requirement was instilled in the Old Testament law also. The priests would have to perform a blood sacrifice for the forgiveness of sins. Blood sacrifice would also be part of the feasts of Israel, such as Passover. John the Baptist was called to be a messenger to “prepare the way” (Malachi 3:1) for the Lord, and what did he proclaim? Can you now see how Jesus, by becoming the “Lamb of God”, fulfilled the Law and the Prophets? Paul would explain that the Law, with all its rules and festivals, was just a shadow of the reality that is found in Christ. Paul would also explain that Christ was our Passover lamb. Going back to the original purpose of this article: Why did God prohibit the blending of the linen and the woolen? Because it was a beautiful type or shadow of the grace of God. Linen is a product of the earth. It’s like a vegetable. It has no blood content. But woolen comes from a lamb. We can only cover ourselves in the presence of God with the blood of a lamb. * This is His requirement. We cannot blend the finished work of Christ with our own works for salvation. This was the sin of the Galatian church. They had begun with grace alone, but then they added circumcision as a requirement for salvation and Paul proclaimed they were being bewitched! Notice how much the woolen and linen look alike. It’s easy to be deceived into thinking that our good works and self-effort can be pleasing to God. This is what Cain thought. But the ONLY acceptable and pleasing sacrifice to God is the sacrifice of Jesus–the Lamb of God who takes away the sins of the world. Linen is a type of counterfeit of wool. Finally, why is shed blood so important to the gospel message? Is it because God is a sadist? No! It’s because it was the only way that God, Himself, could pay the penalty for our sins! This is also why it’s so important to argue for the deity of Christ. As the judge, only Jesus (God) can justly pay the penalty. It would be unjust to put that burden onto another person. But His great love was willing to pay our debt. This is the main message of the Bible–don’t blend grace and works–trust completely in the blood of the Lamb. Now, by faith, by trusting in what Jesus accomplished for us, we don’t have to perform any religious works to please God. We can rest in the cross of Christ. God weaved this great message of the Lamb into the sacred text (the Bible) and into the history of the Jewish people. What a supernatural message this is! And what a great display of love and justice the prohibition of blending woolen and linen is to the universe! * The saints will be wearing fine linen–which is their good deeds. (Revelation 19:8) This is separate from salvation. Previous If Jesus Never Existed, Who Is the “Mystery Writer” of the Jesus Myth? There are two issues I see with your article. 1. Wool does not require the shedding of blood. I can keep a sheep alive for its entire natural life and sheer wool off of it at least once per year. 2. Leviticus has a lot of information about offering grain sacrifices. In fact, the feast of First Fruits and Trumpets were to celebrate the harvest of Barley and Wheat and those materials were sacrificed to God as a wave and burnt offering. Cain’s sacrifice being rejected has created a lot of questions but you’ll be hard pressed to find evidence it was due to the material vs. his intentions, heart, or spirit of giving. Abel’s sacrifice was more excellent than Cain’s sacrifice. And even though Abel is dead, his faith (by sacrificing the proper gift to please God) still speaks. It was the “more excellent sacrifice” that pleased God, according to this verse, not the attitude. God testified of Abel’s GIFT. Woolen is merely the symbol of a lamb. The grain offerings serve a different purpose. They aren’t atoning sacrifices which are necessary for sins to be forgiven. But that is beside the point because we don’t fully know what the offering of Cain and Able were for. Guilt? Sin? Peace? Votive? Also speaking of gifts, considering you are reading from Hebrews and Paul means you can’t overlook gifts in that context which also refer to your actions or behaviors that show dedication to the Lord. The gifts here might refer to the offering but only the peace offering and votive were used as gifts, the others were atonement payments for sin. The grain offering for sin is totally acceptable according to Leviticus. BUT the gifts here might not refer to the offering. Again I would suggest that it was because of his Gifts that Cain had a problem just not his sacrifice. According to Hebrews 12:24, Abel’s sacrifice was a blood sacrifice similar to the sacrifice of Jesus, but not as effective, so it was a sin offering. Abel is commended for his faith in Hebrews 11:4 because he offered the proper gift. God wasn’t pleased with Cain’s offering. Why? Cain and Abel must have heard the word of God concerning a blood sacrifice because faith comes by hearing the word of God. What is there to have faith in if they didn’t hear the word of God? Adam and Eve tried to cover themselves with fig leaves after they sinned, but God covered them with furs. Blood was shed. Adam and Eve must have shared the story of the blood sacrifice with their children. Abel obeyed the word of the Lord and offered the proper gift, while Cain disobeyed the Lord, perhaps thinking that the work he put into his offering should have been pleasing to the Lord–but it wasn’t–because it didn’t point to Jesus, the Lamb of God. The bread (grain) and the wine (blood) are representative of Christ’s sacrifice on the cross for our sins. What Cain offered wasn’t in obedience to the word of God, so it wasn’t offered in faith. Because it represented the work of his hands, Cain tried to overcome the curse of sin by his own efforts rather than by the blood of the Lamb. But Jesus became a curse for us by shedding his blood on the cross on our behalf. We receive this by grace through faith (believing and trusting in the Word of God), not of works, lest any man should boast. Thank you for your informative article. I agree with your observation that salvation can never be gained, even partially by good works, but is entirely dependent on an individual’s reception of Christ as personal Savior. This is difficult for most people, especially religious people, to handle, but you did a very good job of explaining Christ’s redemptive power. As a side note, I wanted to let you know that cotton is not really the source of linen. The source of linen is flax (http://en.wikipedia.org/wiki/Flax), which is a totally different plant. 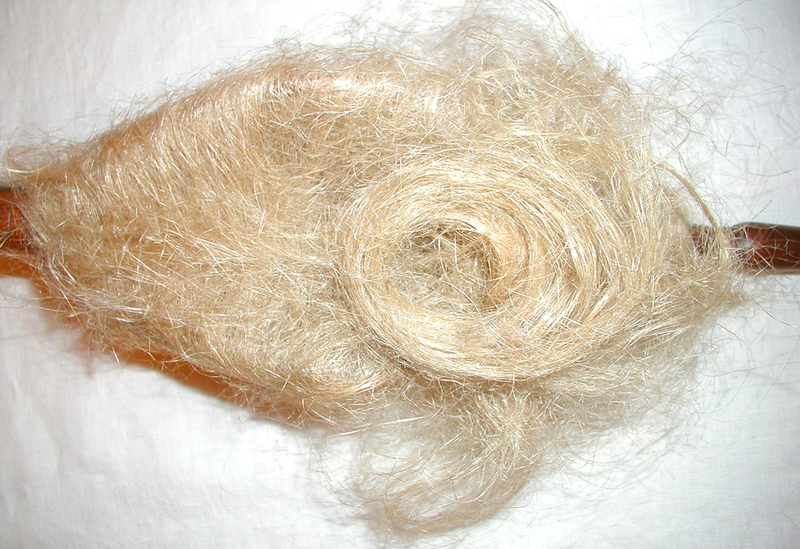 The flax fiber comes from inside the stem of the plant, and is long, strong, and has the appearance of hair or twine. I have not worn much wool in my life due to sensitive skin, but I am interested in finding physical ramifications of wearing garments made of blended linen and wool, as a fiber learner. I have found that religious Jews often have a lab microscopically check suspicious woolen garments for the presence of flaxen materials, which would contaminate it. 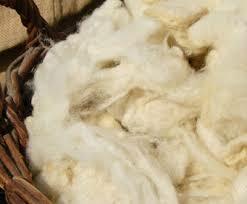 The flaxen/woolen fabric is called Shatnez and is unwearable until one of the two fibers is taken out, if possible. That should be a good consideration for clothing designers and cottage industry fabric makers who seek to increase their range of sales. Presently, I enjoy spinning alpaca, wool, angora rabbit, and flax separately. Hopefully, I will be spinning American bison soon. I hope you will enjoy my blog at spinningjulie.wordpress.com. Thank you again for your article. Thank you, Spinning Julie! You saved me from making a mistake! I hope you don’t mind that I corrected my post accordingly.